The case for pumped hydro in the UK energy mix is put in this paper recently released by the University of Strathclyde, Glasgow. that may be delivered by EES. Second, a market framework that recognises this value is needed. low carbon economic development pathways in general, and the outcomes that may be served by EES in particular. The authors compare the regulatory environment 30 years ago when the electricity transmission and generation were run and funded by a centralised system in which it is relatively easy to identify the value of pumped hydro, to the de-regulated market system operating today. In terms of grid codes today, Electricity Energy Storage is classed as both a generator and consumer exposing operators to both transmission and distribution network charges , as well as to other levies despite the fact that electricity is neither generated nor consumed. Delta Electricity has received development approval from the South Australian government for the 230-MW Goat Hill pumped hydro project. 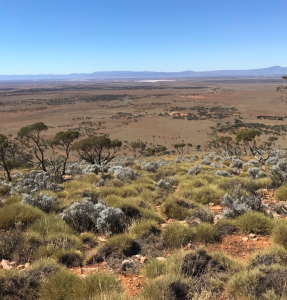 The 230MW/1840MWh project, located 12 km west of Port Augusta will involve an investment of approximately $410 million and create about 200 jobs during construction according to project developer Altura. Work is already underway for detailed plant design and construction contracting so the Goat Hill project may be the first ‘shovel ready’ pumped hydro project in South Australia. The project is moving towards reaching an investment during 2018. The developer estimates the construction period will be two years and first generation is possible by late 2020. 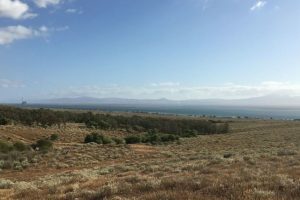 The project is located near Lincoln Gap near Port Augusta in the Spencer Gulf. Water supply for this project will be from the SA Water Morgan Whyalla Pipeline. Evaporation covers will minimise losses. Snowy Hydro’s independent Board of Directors has approved the Snowy 2.0 feasibility study, and for further work to be undertaken for the project to progress to a final investment decision in 2018. According to the feasibility study released 20th December 2017 the technical and financial feasibility is confirmed. The board has withheld the chapters of the report which show the financial modelling and pricing of the project on the grounds of being commercially sensitive. 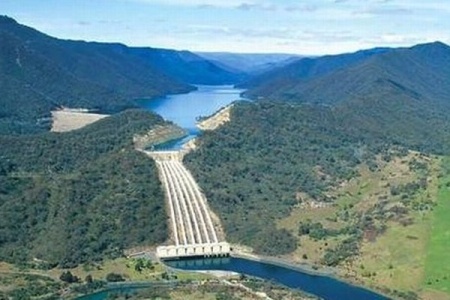 Snowy Hydro’s CEO, Paul Broad, said that progressing Snowy 2.0 was a strategic business decision and the projected return on investment would enable the company to fund the project. More details are available at Snowy Hydro. In an ASX announcement Genex Power reported on its Technical Feasibility Optimisation which upgrades the storage from 6 to 8 hours operation at 250 MW. This is an additional 33% over the earlier indications that it would provide 6 hours operation at 250 MW. Other conclusions from the optimisation are that variable speed pump-turbines will provide a better outcome than the originally proposed fixed speed pump-turbines, and that the upper reservoir can be provided by using the existing Wises pit rather than the proposed turkey’s nest dam. Utilising the existing pit will reduce capital cost. Modelling by Mott MacDonald showed that by using variable speed pump-turbines the start up time can be reduced to less than 30 seconds. The TFS optimisation concluded that the project cost, including contingency, is about $330million. The project also requires the construction of a 275 kV transmission line to connect to the existing infrastructure at Mt Fox. Snowy Hydro boss Paul Broad has been out and about talking up the merits of pumped hydro over chemical battery storage such as the much touted Tesla installation in South Australia. According to AFR, Snowy Hydro has been crunching the numbers and reveals that the cost of Snowy 2.0 and transmission lines would add $127 per year to the average household electricity bill by 2027. Snowy Hydro says that providing the same storage using batteries would add a staggering $4000.00 per year to the average bill. Its hard to believe that such numbers could be true. The shear magnitude of the snowy 2.0 project gives some credibility to the notion that pumped hydro could be cheaper for large storage. A characteristic of pumped hydro is that the magnitude of energy stored is related to the water volume, and for a given power station size, the water volume can often be increased at low marginal cost, and so per megawatt-hour the cost can fall dramatically. In the case of the Cultana project costed at about 1/3 the cost of equivalent batteries for the same energy storage, the storage component could be increased by increasing the size of the upper turkeys nest dam. The dam cost portion of the project is quite low at less than 10% of project cost. 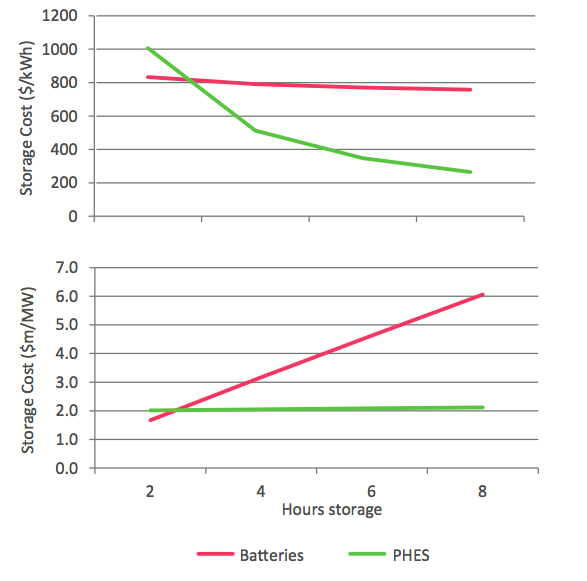 This chart taken from the Cultana Knowledge Sharing Report shows that increasing hours of storage has a low impact on overall project cost and shows significant reduction in cost per unit of storage. In the case of the Snowy Hydro project, because the dams to be used, Talbingo and Tantangara, are both existing the storage element of the project is already provided, and the costs will vary with the nameplate capacity of the project. And because the dams can store an enormous amount of energy, the per unit costs is expected to be quite low. Snowy Hydro is not releasing much detail about the project, but based on rudimentary information about the elevation difference between the two dams and a generating efficiency of around 85% the energy storage potential can be estimated. Tantangara stores 254 gigalitres which is 87 times larger than the Cultana project. Talbingo stores 920 megalitres of water and is about 600m below Tantanagara — this 600m of head is more than double that available at Cultana. Assuming that only half the capacity of the smaller of the two dams is available for the pumped hydro operation, that is about 43 times more volume and double the head for about 80 times the energy available at Cultana. Cultana stores about 1.7 gigawatt-hours of energy, and that would suggest Snowy 2.0 can store about 136 gigawatt hours of energy. Compare this to the entire world’s production of lithium batteries of about 35 gigawatt-hours per annum — this would mean that to provide the same storage capacity in lithium batteries would require the next 4 years world production of lithium batteries to be dedicated solely to this project (or assuming Tesla’s new battery gigifactory does come on line fully by next year, it may mean about three year’s production.) Its clearly not credible that batteries could offer a high penetration of grid scale storage any time soon and gives credence to the idea that large scale storage is better provided by pumped hydro than batteries. The idea that batteries could ever add $4000 to the average electricity bill though is quite bizarre. For small scale storage batteries have a clear advantage and can be deployed very quickly. When used behind the meter they are already economical and any tendency for power prices to rise will encourage the use of storage in this manner, and so the possibility of prices rising to the stratospheric levels suggested by Broad is implausible. You can read the full Snowy Hydro story in AFR here. A consortium of EnergyAustralia, Arup and The University of Melbourne’s Energy Institute (MEI), with funding assistance from ARENA, has undertaken a feasibility study for a seawater pumped hydro project in South Australia’s Spencer Gulf. The study found that the the project is technically feasible with a capital cost of just over $2.1 million per MW of capacity and $270 per kWh of storage. This is towards the high side for pumped hydro projects due to relatively long penstocks and the significant structures to exchange water with Spencer Gulf. Full details of the study can be found here in the form a knowledge sharing report. Pumped hydro in China exceeds entire Australian coal power capacity. Existing pumped hydro in China as at end of 2016 amounts to 26 Gigawatts compared to entire Australian installed coal capacity of 22 Gigawatts. According to Qian Ganglian of China Renewable Energy Institute, at the end of 2016, the Hebei Fengning Pumped Storage Power Station (3,600MW) is the largest pumped storage power station under construction. The Guangdong Guangzhou Pumped Storage Power Station (2,400MW) and Guangdong Huizhou 1 Pumped Storage Power Station (2,400MW) respectively boast the largest installed capacity currently in operation. The station with the largest pump-turbine under construction is Guangdong Yangjiang Pumped Storage Power Station (400MW). The Zhejiang Xianju Pumped Storage Power Station (375MW) boasts the largest pump-turbine currently in operation. Zhejiang Changlongshan Pumped Storage Power Station has the highest head under construction with rated head of 710m, while the operational Shanxi Xilongchi Pumped Storage Power Station has a rated head of 624m). China has embraced the need of storage in the network and clearly recognises the value of pumped hydro in a network with increasing penetration of renewable generation. The value proposition for pumped hydro is partly related to the long transmission lines from the wind and solar energy rich areas of the north west to the high demand areas of central and east china. In this respect the long transmission lines are reflective of Australia’s long thin network. Pumped hydro acts to flatten the peaky output of both wind and solar and make better use of, or postpone or eliminate transmission augmentation. In this way it can be considered a transmission asset rather than a generation asset and recognition of the value of this role will need some market adjustment in Australia. Being a largely state owned electricity grid makes it easier to make decisions beneficial to the grid at large. Pumped hydro can reduce the overall cost of generation/transmission and in the past when our electricity generation and distribution were government owned, pumped hydro projects such as Tumut 3, Wivenhoe and Sholhaven were built. Yet in a market such as the NEM its not clear how it can reward pumped pumped hydro (or any storage) adequately as a commercial enterprise. We see some progress now with the announcement of the Snowy Hydro 2 pumped hydro project and yet the feasibility study is being done by political decree and it will be interesting to see how the numbers stack up. AEMO proposed changes to the 5 minute rule for bidding and settlement may also help the numbers stack up. 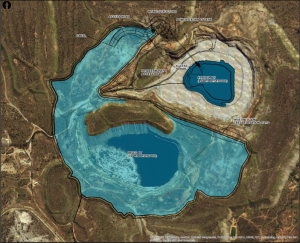 Research from The Australian National University has identified 185 potential sites for pumped storage hydro installations in South Australia. South Australia is the state with the largest proportion of variable renewable electricity (wind and solar PV). This is expected to increase into the 50% to 100% range in the coming years. The sites are published in the South Australian Pumped Hydro Atlas. “Our work shows that there are many sites in South Australia that may be suitable for establishing pumped hydro storage, to help build a sustainable, secure and affordable electricity grid,” said Professor Blakers, the study’s lead researcher from the ANU Research School of Engineering. Last week, Forces Motrices Hongrin-Léman SA officially inaugurated Switzerland’s second most powerful pumped storage power station in Veytaux. 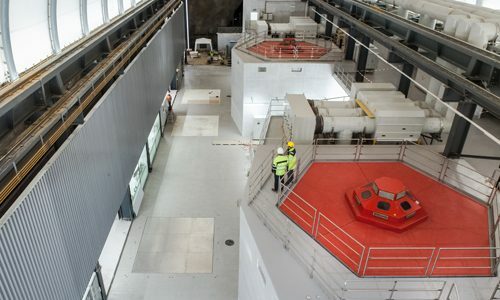 With the FMHL+ project the capacity of the Veytaux pumped storage power station will be increased from 240 MW to 480 MW, with 60 MW acting as a reserve. To achieve this, two machine groups with 120 MW capacity each have been installed in a new cavern that has been constructed since 7 April 2011. 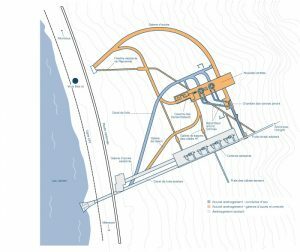 The pumped storage power station Veytaux will play a crucial role in supplying electricity to the French-speaking part of Switzerland. The project is the response to the increasing demand for balancing energy, which has been triggered by the rapid development of the new renewable energies that generate energy in an intermittent and fluctuating manner. The existing power station consists of four 60 MW pelton turbines and the new additional capacity will be provided by two 120 MW generating units. 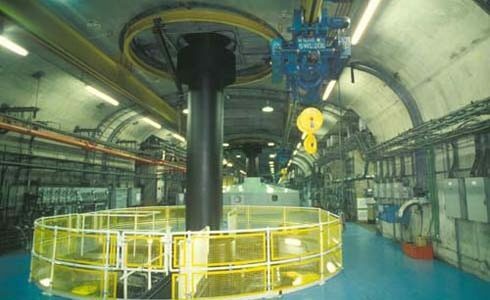 The power station operates with a head of 800m from upper reservoir of Hongrin and is discharged into, and pumped from Lake Geneva. They new units were constructed in an impressive cavern that is 100 m long, 25 m wide and 56 m high, and are controlled remotely by Alpiq’s Centre d’Exploitation et de Gestion de la Production in Lausanne. The construction work was carried out without major incidents and within budget. Veytaux pumped storage power station is Switzerland’s second most powerful behind the Linth-Limmern facility in the canton of Glarus. The CHF 331 million invested by the FMHL partners – Romande Energie (41.14%), Alpiq (39.29%), Groupe E (13.14%) and the City of Lausanne (6.43%) – demonstrate their long-term vision within an energy context that is not very favourable for hydropower. The low wholesale prices on the European power market do not reflect the value of hydroelectric energy nor the essential role played by pumped storage power stations for the security of supply. Pumped storage power stations provide control energy that is indispensable for the balancing of the electricity grid and are currently the most efficient way of storing vast quantities of electricity and feeding them back into the grid when demand is high. Pumped storage power stations are essential in order to ensure the stability of the Swiss and European electricity grid in view of the rapid development of wind and solar energies. Already rich in hydro, pumped storage can make better use of available resources, with Tasmania hoping to become the renewable energy battery for Australia. Prime Minister Turnbull announced plans to expand existing hydro capacity and add the possibilty of 2500 MW of pumped hydro. ARENA will examine four large projects: Mersey Forth-1, Mersey Forth-2, Great Lake and Lake Burbury – with capacity of around 500-700 MW each – and an alternative of nine small scale sites totalling 500MW. Turnbull says pumped hydro can further stabilise the National Electricity Market and underpin additional wind investment in the State. This announcement also refers to the study by Dr John Tamblyn on the case for a second interconnector to the mainland. Dr Tamblyn’s report finds another interconnector might be beneficial, but will depend on the ongoing development of the electricity system in Tasmania and the National Electricity Market. See full transcript of press conference at Trevallyn here.